I arrived at the starting line at about 4:10 and now had to wait about 20 minutes before the race gun went off. I felt pretty good and relaxed, but you never know what you are gonna experience until you get a few miles into the race. I had some apprehension because I had a growing need to pee, despite going twice in the past hour. To make matters worse, with the Las Vegas sun setting, I began to question not bringing gloves. I do have a problem with Reynaud’s Disease, where my hands can get extremely cold and painful and almost always am afflicted with it, especially during and after marathons. The race started promptly at 4:30 with a lot of fanfare and excitement. I started running within 10 minutes (your time doesn’t start until you cross the starting line) because I was in corral #6. You start the course by heading away from the strip, towards the airport for about a mile, before making a U-turn and heading back north. I went off at a super conservative pace of about 9:30 – 10:00 minutes per mile. The route was congested but I didn’t have any problems getting around people who clearly should’ve been lined up in the back or who had already started walking. There’s plenty of space here and there were only a few spots in the race when I felt like I couldn’t run the pace I wanted to. By mile 2, the urge to go to the bathroom was weighing heavily on my mind. I knew I had better take care of business soon. Luckily just before mile 3 I found a vacant port-a-pottie (talk about a miracle) and took a good 30 – 40 seconds taking care of business. I found myself pretty warm: my hands were fine and I had worked up a good head of lather at this point. I had opted for shorts, my fuel belt, and 2 short-sleeved shirts (one top of the other). That outfit proved to be best, although I probably could’ve gotten away with just 1 shirt. I crossed the 5K mark in just a hair over 30 minutes, despite the bathroom break. While I was a little slower than I’d like, I was happy I hadn’t busted out of the starting line too fast. I still had more than 23 miles to make up a little bit of time. 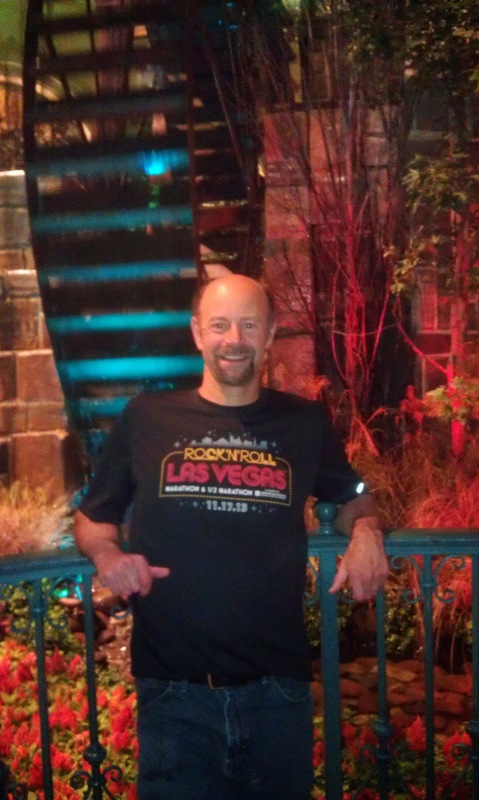 Running the Las Vegas Strip is an experience that every runner should experience – especially if you love Las Vegas. The crowds were very supportive and there were plenty of signs. My favorite was “1 out of 100 marathoners poop their pants – are you that 1?” Made me giggle for the entire race. Another one was “You have trained longer for this than a Kardashian marriage”. Bingo. Also, “Run now, Buffet Later” I was feeling good and enjoying the experience of once again taking on the Strip. I hit the 10K portion in exactly an hour. Again, a little slower than I had wanted, but still easy and at least an even split. I was hoping to hit the halfway point at about 2 hours and then try for a negative split. From everything I’ve read that is the best way to approach a marathon and I was hoping for a 4 hour marathon. I wound up hitting the 13.1 mile marker at 2:03. At this point, the course starts to get somewhat hilly, including a 2 mile climb up near the North Las Vegas airport. In addition, you are in North Las Vegas running down what appears to be some “iffy” streets. Granted, there was a good police presence there, but I’d hate to put in a training run along here. Some of the residents did come out to cheer us on, but for the most part it was pretty sparse. At this point, I knew that if I wanted to hit my time, I’d have to up the pace a little. What was nice – and this is a first for me – is that I was passing people – many people – in the latter stages of the race. Normally my pace drops precipitously as the race goes on, but I felt my pace get slightly faster. I wasn’t lapping my miles on my Garmin, but I was making good ground. I do remember seeing some of my miles though getting around 8:30 / 8:45’s. 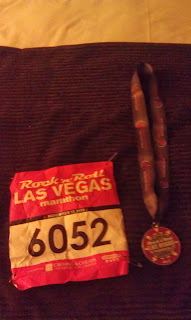 I was still feeling good and had gone through 3 gels by mile 18 and had used about half the fluids in my fuelbelt. 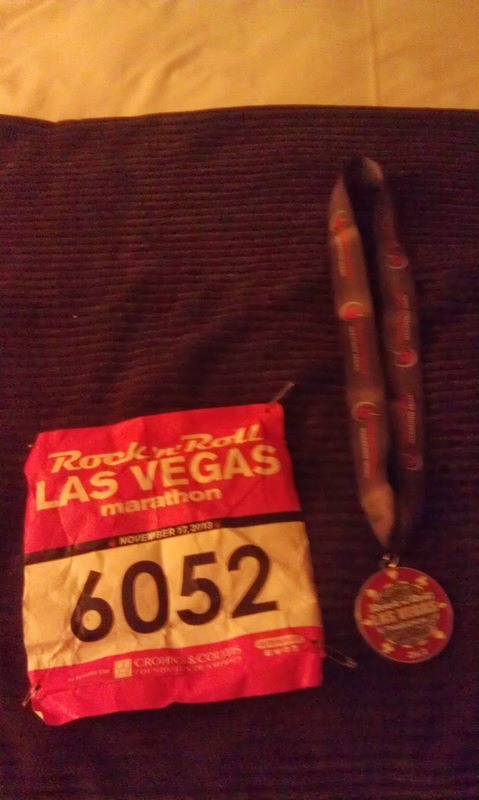 Around mile 22, you come back and run down Fremont Street. Running down this light infused tunnel is nothing short of a religious experience. You have party-people to the left and right in fairly close proximity cheering you on, offering high-fives and you have some decent band support as well (including an 80’s metal cover band). I know this was a major motivator for me. Around mile 23 you leave Fremont Street and suddenly you are on a forlorn and darkened street that sort of resembles a super-wide alley. There’s no crowd support here other than the occasional homeless person and you can see the lights of the casinos – but they are still about a mile or so away. The runners had thinned at this point, maybe 50 yards separating each runner. Here is where the wheels came off. Try as I might I couldn't get going again. I thought about trying another gel but all I had were caffeinated ones and I didn’t want to be up all night. I suddenly saw my 4 hour marathon goal start to be questionable. My 9 minute miles suddenly were anywhere from 10 – 12 minutes and I was chugging the last of my Gatorade in greater gulps. Suffice to say the last 5K was tough. I never walked, but I was definitely out of gas. I crossed the finish line in 4:14:17, which is a decent time given the bathroom break and to be honest, it’s about where my training said I would finish. Shari spotted me coming across the finish line and was able to hand me my gloves and a sweat shirt. Normally I freeze after a run and thankfully I had these to keep me warm. Finally I could enjoy some of the post-race spread without shivering. I fought an initial wave of nausea and dizziness after finishing (normal with all the blood pooling) and a medic asked me if I was okay. I grabbed a bottle of water, Gatorade, chocolate milk and some protein bars and pretzels. To get out of the finish corral required some effort. 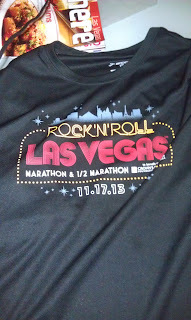 While the finish line was right in front of the Mirage, I had to walk a good quarter mile (if not more) to the south end of Caesar’s Palace to get out of the enclosed area. Then I had to walk all the way back on the crowded sidewalks to the Mirage. It probably took me a good 30 minutes. To be honest, the walk did me good, but I wished I had gotten out of the sooner. You can go to http://running.competitor.com/cgiresults?eId=27 to see my results as well as photos taken during the race. Walking through the Mirage was like being greeted to a hero’s welcome. Dozens of people saw my medal and congratulated me. There were lots of other people with medals too – some had already cleaned up and were out and about (probably half marathoners). I cleaned up and took a long bath. We called to see if the Mirage buffet was open and sadly it wasn’t. My ritual of a post-race buffet was not going to happen, so I made a meal on my pretzels and a protein bar and wound up hitting the sack about 30 minutes later. 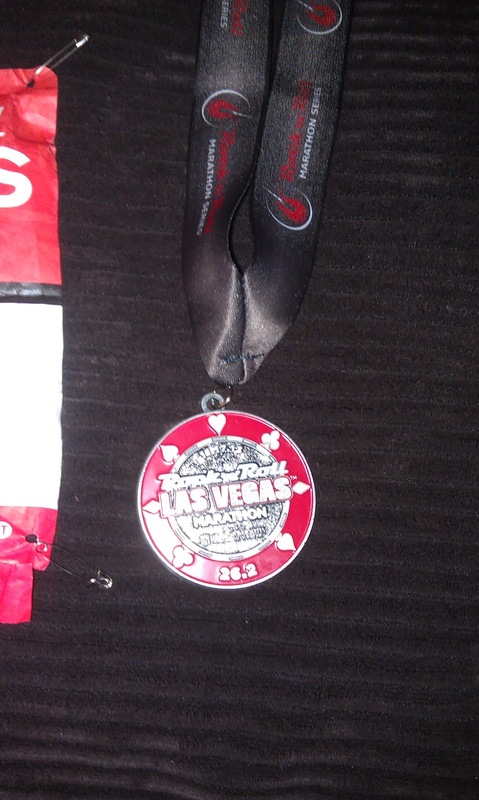 I have attached photos of the medal and shirt.